Are you at further risk? Head injuries can result from sports injuries, a direct trauma to the face, head or neck, a whiplash injuries, motor vehicle accidents, violence and falls. They can result in concussion, a loss of consciousness, dislocated jaw joints, spinal joint stiffness and adaptive muscular shortening. 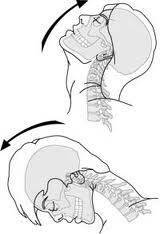 Neck pain, ongoing headaches and jaw dysfunction can be associated with head injuries. Concussion is common in all contact sports and sports where there is a risk of falling or collision. The incidence ranges from 0.25-5 per 1,000 player hours of exposure. Professional horse jumping jockeys have the highest concussion rate of any sport, followed by Australian Football. Rugby league, rugby union, soccer, martial arts, boxing, netball, water-skiing, motor racing, cycling, basketball and gymnastics also have high rates of head and neck injuries. At the time of injury, a person with a head injury should be assessed by a qualified medical professional, who will exclude spinal and brain injury and any other serious consequences. They will determine the person’s ability to return to sport/daily life or the need for further medical treatment. Some people will develop immediate musculoskeletal symptoms, and some symptoms will develop 2-10 days post-injury, there’s a possibility that some symptoms won’t develop for up to six weeks. These include; neck/facial pain, headaches, jaw pain, grinding/clicking/popping sensations at the jaw joints, dental malocclusion, tightness in the neck and shoulders and referred sensations in the arms. If any of these symptoms develop, the injured person should be assessed by a Physiotherapist. Left untreated, these symptoms can result in chronic headaches, neck, jaw and dental dysfunction, increasing the risk of future serious injury and speeding up the degenerative process. At Rathmines Physiotherapy and Sports Injury Centre, all Physiotherapists are experienced in the diagnosis and management of head and neck injuries and pain. For advice or to book an appointment, please contact us on 49751622.